One of the ways the state of California hopes to meet its greenhouse gas emission reduction goals is by replacing gas-powered cars with electric vehicles. To that end, the California Air Resources Board has created several programs, funded by cap-and-trade, to help state residents buy electric cars. But—so far—the state has not offered any help to people who want to purchase electric bikes. People tend to dismiss the idea as inconsequential, but electric bikes could help people replace many of their short car trips—and most trips in California are under three miles, a distance easily covered by an e-bike. Shifting those trips to bikes has added benefits that you can’t get with electric cars, as well, including reducing congestion and helping people get some healthy outdoor activity. So BikeSGV, instead of waiting for state action, created its own rebate program. When it is complete, the pilot program will have helped community members buy 100 electric bikes—everything from folding to cargo bikes. Most of the bikes purchased through the program are electric assist bikes, without a ‘throttle’ option, which require pedaling and just add a boost when needed. Working with the City of El Monte, BikeSGV had applied for funds raised by new toll lanes on the I-10 freeway. By law, the revenue from those tolls must be reinvested along the corridor, and forty percent is earmarked for active transportation. The city and BikeSGV received $70,000 for the e-bike rebates, as part of a healthy communities program that included other components, such as cycling classes and bike fix-it stations. At first, they planned to offer $350 rebates, but there wasn’t very much response. Electric bikes run anywhere from $700 for the cheapest models to over $2,000, a lot of money for people who don’t have much. BikeSGV got permission to double the amount of the rebate to $700, which allowed them to offer 100 rebates. 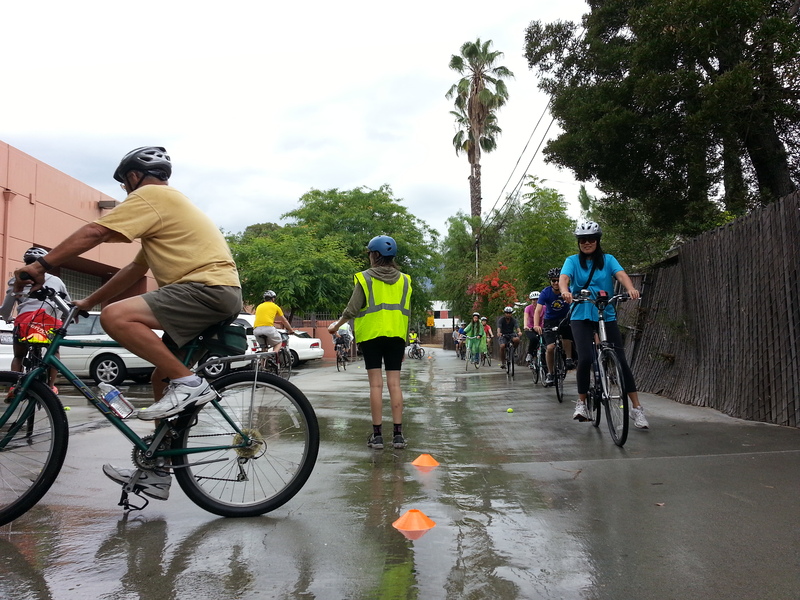 To be eligible for a rebate, applicants had to take one of BikeSGV’s standard City Cycling classes (a free three-hour class that incorporates in-class discussions and on-bike skills practice) and live within three miles of the express lanes on the I-10 corridor. The area encompasses about ten cities, and much of the community is low-income and heavily burdened by pollution from local sources as well as the freeways themselves. The pilot program officially ended on December 31, and BikeSGV is in the process of winding down the paperwork on the last rebates. There is a waiting list of interested e-bike buyers hoping the program will be extended. Of course, this is useful information and can help with ongoing statewide advocacy efforts to add e-bikes to the list of electric vehicles eligible for rebates. The more data there is, the stronger the argument in favor of adding bikes. But why are we even having this argument? There’s no similar standard for electric car rebates. The Air Resources Board doesn’t question the purpose of trips made in new electric vehicles, so why is that an important question for e-bikes? Any bike trip is one less car trip, and if electric bikes make it possible for more people to get on bikes, why wouldn’t the state want to support that? It’s easy to make the case that supporting more bike trips will help California’s climate goals, and at the same time reduce congestion, which all the electric cars and road building in the world will not achieve. It’s a matter of investment priorities. California is very much a car-dependent state, and it is planning to remain one. And they offer rebates for electric motorcycles too – even more argument to offer for bikes. ? Thanks for covering. I’m optimistic that ebikes will be a far more cost effective way of replacing trips in cars than EVs, not to mention safer and greener (less particulate matter from tire wear). Hopefully this will give us some hard numbers that reflect that. Caltrans recently allocated $34 million to 125 projects under the Low Carbon and Transit Operations Program. It's not a lot of money, but these relatively small investments have the potential to make an immediate difference in local, and global, emissions. This bill could give Uber and Lyft a strong interest in making bike-share successful and encouraging its use--and could also motivate them to support cities in improving bike infrastructure to get more people riding them.